There is a long history of narrative therapy approaches being used as a response to serious mental health concerns. Much of Michael White’s early work involved responding to people who were experiencing psychosis (see the reference below to the interview ‘Psychotic experience and discourse’ from 1995 and the work of the Dulwich Centre community mental health project). And so it seems really appropriate that this first on-line Friday Afternoon at Dulwich relates to mental health concerns. Amanda Worrall is a mental health nurse in the Northern Territory (Australia) and a graduate of the Dulwich Centre International Graduate Diploma in Narrative Therapy and Community Work. In this video presentation, Amanda describes her conversations with June who was consulting with an adult community mental health team. During this time, June was meeting with Amanda (mental health nurse), the psychiatrist on the team who was prescribing medication, and she was also receiving psycho-social support from a non-government organisation and was in regular contact with her parents. In this context of team work, this presentation tells the story of how June and Amanda found ways to use externalising conversations to name and speak about social paranoia (SP). It also describes the ways in which these conversations have enabled June to reclaim her life from the effects of paranoia. 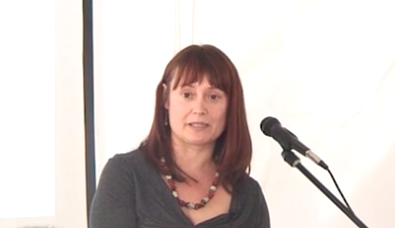 This presentation was filmed at Dulwich Centre at the International Spring Festival of Narrative Practice that took place from September 21-23, 2011. Just prior to this event there was a one day workshop by Karen Young and Jim Duvall from Canada that Amanda refers to in her talk. * White, M. (1995):‘Psychotic experience and discourse (Stewart, K. interviewer).’ In White, M.: Re-Authoring Lives: Interviews & Essays (chapter 5), pp.112-154. Adelaide: Dulwich Centre Publications. If you have other suggested readings, please let us know. Dear Amanda and June. I have just watched this video as part of my course. How inspiring. I always knew that I had to fight paranoia, (like Loretta, I call them negative thoughts) but until watching this video, I had not realised how deeply entrenched they were. I could identify with so much of what June described. I too live alone with just my dog but I work with seniors who share their stories with me. Your image of getting in the car and leaving SP at home was so helpful. It is something I have now adopted. When with friends, I often wonder what they are really saying (paranoia) by taking June’s advice, I will now watch their cues and if still in doubt, ask them. Amanda, your PP’s were very helpful. I will be spending some time reflecting on the “Mapping the effects” and the quotes and other guides you provided. Thank you both again. During our narrative supervision group this morning at the Narrative Therapy Centre of Toronto we viewed the ‘Inviting Paranoia to the Table’ video and what great learning it was for us – not only about the ‘sparks’ of SP, but also just useful ways of engaging with various narrative practices. One of us works with many people struggling with the voices of paranoia and June’s telling had her thinking about how SP also tells ‘lies’ quite often to them . By sharing your story of ‘75% lies’ with them she imagines their own isolation lifting by having connection to your experience. We wanted to write to says thanks and let you know how much we appreciated the conversation that was generated amongst our group today from hearing your ideas in relation to talking about paranoia. Thank you so much for sharing your story. I really appreciated that you allowed yourself to be vulnerable. When you talked about noticing the way SP lies to you 75% of the time it reminded me that I don’t have to always believe the things the negative voice (that’s what I call it) says to me. I do try to evaluate what it says, but I needed another reminder today, so “Thank you”. Do you have any tips about ways to keep this idea present, as I find it a bit ‘slippery’? Like you I try to compare the person’s body language, tone of voice etc with what the negative voice is telling me they are thinking. I felt really moved by the comment “I think we all have vulnerable times in our lives and social paranoia has an effect on all of us to some degree at some times in our life”. By saying “vulnerable times” it reminded me that the hard times don’t last forever, and the rest of the comment reminded me that we all have struggles, so don’t need to feel alone. Thank you for your reminder of the importance of therapeutic letters, and the wonderful way they can capture the possibly forgotten thoughts and significant moments. I’m inspired to try to write more often! I also really like Outsider Witness retellings, in the way people’s lives become linked and ideas are shared. June I’ve just had a chance to hear about some of your work with Amanda. I work as a therapist in melbourne and found it very helpful to know that conversations inviting paranoia to the table are taking place. Do you think there should be more conversations like this? June and Amanda, I was most interested in the images that represented different parts of your experience and talking. Was it helpful to have those images or pictures to describe what was happening? From listening to your work together you’ve reminded me to ask more questions about this and to explore how this can be helpful. Finally, sometimes people ask me about how to weave together the different maps of narrative practice. The next time I’m asked this question – and if it’s okay by you June and Amanda, I’m going to remember how you were able to draw on different conversational guides over the different times you met. I was delighted and honored to share your stories, in particular the stories of June’s experience. It was extremely enlightening for me to hear how June developed a new relationship with SP over time, and how at first she made a stand against the unhelpful things that SP was bringing into her life, which then lead her to be in a position to stand up for what she had identified as being more important than allowing SP to take her over. June’s story has left me feeling energized as it has reminded me of how important it is to work towards what I am passionate about, to find courage and energy from within to make positive changes, and to support others in doing this also. Thank you for sharing such an inspiring story of perseverance, personal strength and courage in the face of great challenges. I wish you both all the best on your future journeys! I really have enjoyed hearing about how SP has a seat at the table. I particularly enjoyed the image of the paranoia being like sparks at a bonfire. I had all these images of how people try so hard to stay away from the glowing embers so one won’t accidentally touch them (heavens!) lest they get burned. So I was thinking about what kind of protective asbestos special suit you both most have to be able to play so brilliantly with the fire to unleash the gifts it has to offer – – like learning how take the fire along to coffee dates and being able to read people’s cues. I would like to know about these special suits that turn something others fear into a useful ally. Maybe someday I can hear more about this. thanks for telling me about this…. Thankyou for the fabulous image that i now have in my mind of the protective asbestos special suit. I’m really tempted to invite June to join me in designing and drawing such a suit; how it might look, what colour it would be, what special gadgets would manifest as a result of all the different knowledges and skills. I’m even thinking comic book….okay…. time to go and allow my imagination to play with this image.